Vani Hari, the self-styled Food Babe and chief science expert at Food Babe LLC, has become a celebrity with mainstream media TV because she is thin and pretty and says things with a lot of earnest belief. Sometimes she is more kooky than others, like when she insisted she never uses a microwave oven because no one ever thought to test them and they 'create severe health issues'. She must have gotten a lot of otherwise loyal acolytes telling her she was wrong because she has since deleted the 2012 post. Maybe it was never written by her, maybe it was written by her assistant, Krista, or maybe she just hacked together every naturalistic fallacy she could find. Maybe she took it down because there was a whole giant Reddit thread debunking her - even NPR criticized it - but it is hard to say for sure. Microwaves were never thoroughly researched before adoption in the United States. The microwave oven was developed more than 80 years ago, and in WWII German solders were given these ovens to warm meals. Germans conducted several studies about the biological effect of using microwaves, which were transferred to the United States for further scientific investigation, but were never researched thoroughly before these ovens were mass produced for the general public. The FDA even states today that there have been no long term studies on the effects of microwaved foods on humans; however, the studies that the Germans produced are actually some of the same ones Russia used in issuing their temporary ban of microwave ovens in 1976 (it was lifted after a change in political power). The studies produced indicated that several of the German soldiers developed cancers of the blood and that microwaves voided nutritional content of the food. 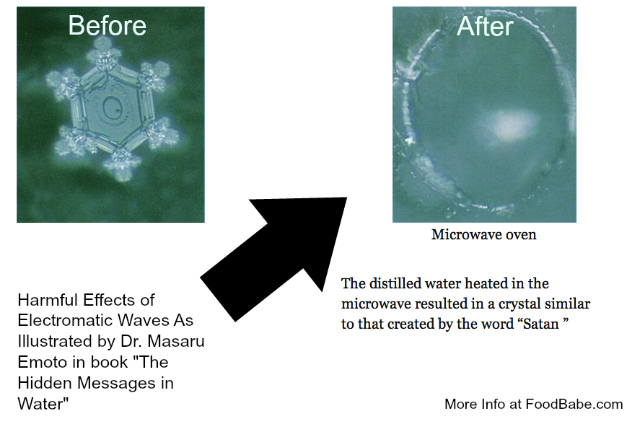 Microwaves destroy the nutrient value of your food. Live, healthy, and nutritious foods can become dead in a matter of seconds when you use a microwave. We are the only species on the planet that destroys the nutrient content of our food before eating it.A study published in the November 2003 issue of the Journal of Science of Food and Agriculture found that broccoli cooked in the microwave lost up to 97 percent of its antioxidant content.In the book “Health Begins in the Colon” – Dr. Group says that a microwave oven decays and changes the molecular structure of the food by the process of radiation. The radiation breaks down any vitamins and minerals in the food and changes its natural structure. Your body cannot handle these irradiated molecules and they eventually weaken your immune and digestive and don’t provide you with proper nutrition. Also, it is widely known that vitamin B12 becomes completely inactive once heated in a microwave. This is a critical vitamin for plant based eaters, since our soil has been depleted of this important vitamin over the years. Dr. Mercola quoted one study where it was discovered that microwaving can destroy the essential disease-fighting agents in breast milk that offers protection for your baby. The study found that microwaved breast milk lost lysozyme activity, antibodies, and fostered the growth of more potentially pathogenic bacteria. Microwaves create carcinogenic compounds in your food. Heating meat, dairy products, plastics and paper have all been shown to create carcinogens. The Nutrition Action Newsletter reported the leakage of numerous toxic chemicals from the packaging of common microwavable foods, including pizzas, chips and popcorn. These chemicals included BPA, polyethylene terpthalate (PET), benzene, toluene, and xylene. Microwaving fatty foods in plastic containers leads to the release of dioxins (known carcinogens) and other toxins into your food. 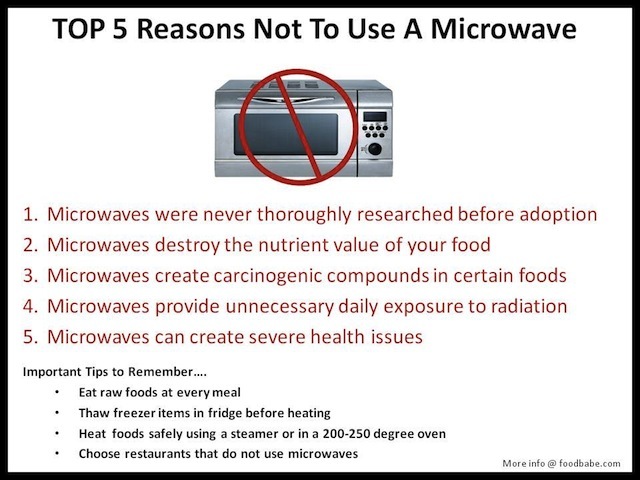 Microwaves can create severe health issues. The massive adoption of the microwave and the increase in obesity can be linked. The microwave has made it extremely easy and convenient to eat processed foods and then further destroys its little nutritional content. The more dead food people eat, the more calories they consume trying to get the nutrition their body so desperately needs.A Swiss clinical study conducted by Dr. Hans Ulrich Hertel found significant and disturbing changes in the blood of individuals consuming microwaved milk and vegetables. Eight volunteers ate various combinations of the same foods cooked different ways. All foods that were cooked in the microwave caused changes in the blood of the volunteers. Hemoglobin levels decreased and overall white cell levels and cholesterol levels increased. The doctor in this study was actually able to cure people who were diagnosed with chronic fatigue by having them literally throw out their microwave. When’s the last time you used a microwave? At my house, I still have a microwave, but I never turn it on. I use it for the timer feature and that’s about it. If you have any suggestions on how I could use this space above my oven in an aesthetically pleasing way, I’m open to suggestions! If you know someone who could use this information, please share it with them! You could be a lifesaver. Yes, Vani Hari thinks that by demonizing microwave ovens, she is saving lives. This explains why she thinks the ingredients that have been used in beer for hundreds of years are dangerous for her husband.